My parents were vagabonds in the early 70’s, crisscrossing the States in my mom’s ’68 Firebird. I wrote of it a few years ago. This past week on the heels of my photographic trip down memory lane, I asked my mother for a copy of a photo that was burned into my mind as a child. 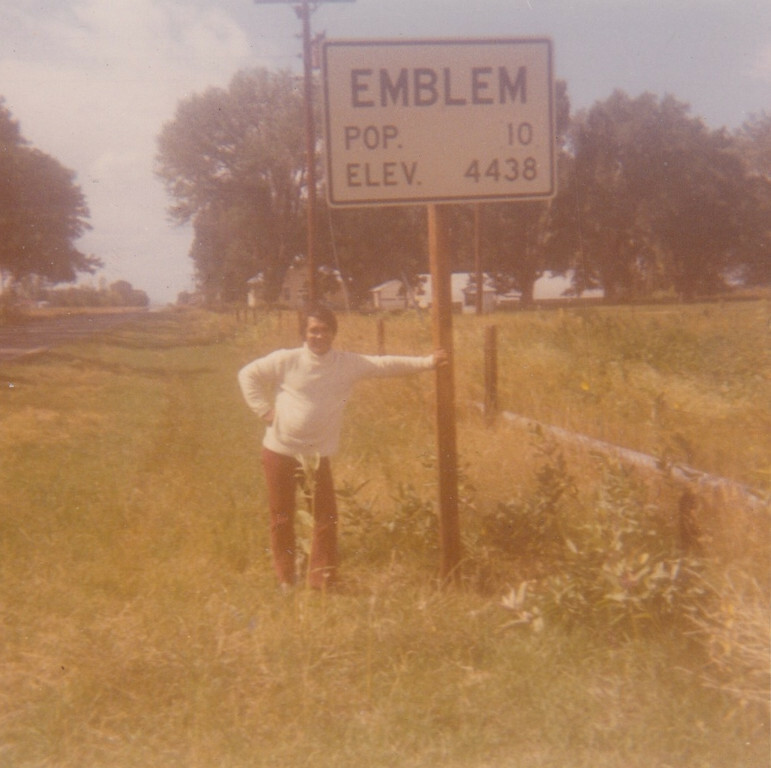 It was a picture of my dad standing near the Emblem, Wyoming sign. In over 3 decades the town never grew in population. I find that fact pretty amazing. What is the “smallest town” you’ve ever been to? On the Long Island north shore’s far eastern end is the town of Orient. From there you can catch a ferry to New London, Connecticut. Or – exit the ferry from New London as it were, here on the Island. When you roll off of the Long Island bound ferry, you are greeted by a big green sign that in my case, tells me I’m home. 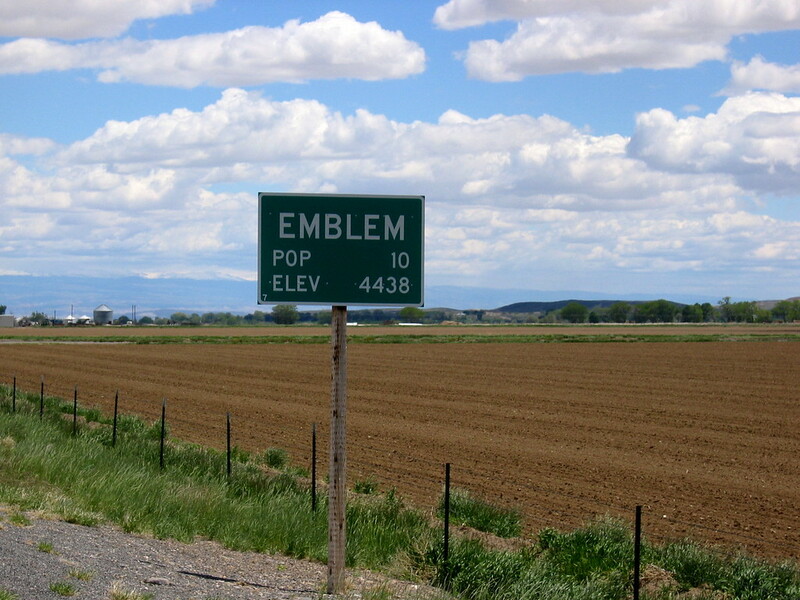 Do you have a picture of your bike in front of your home state’s “Welcome” sign? 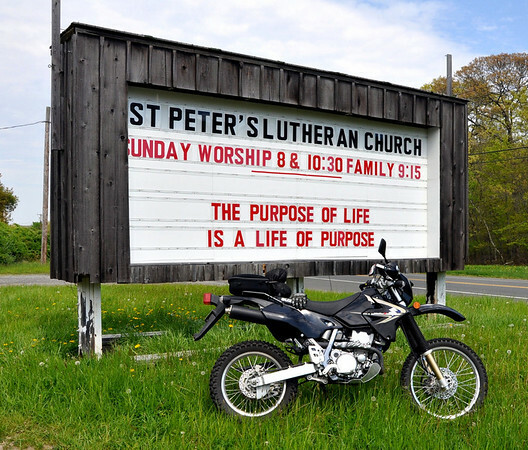 I love this message: The Purpose of Life is a Life of Purpose. This sign is found on Route 25 in Greenport, NY. Their signs are consistently entertaining. Looking for a sign from God? This might be it. To Tell The Truth: Will The Road You Are On Get You To My Place? 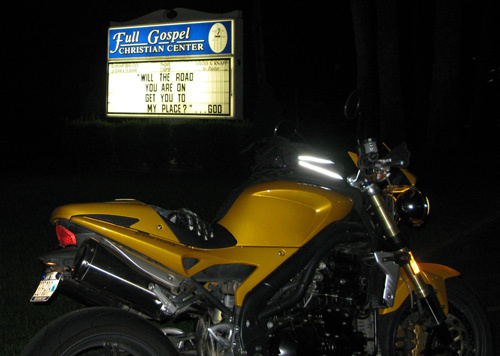 I ride past this church sign all the time on the way in to town. 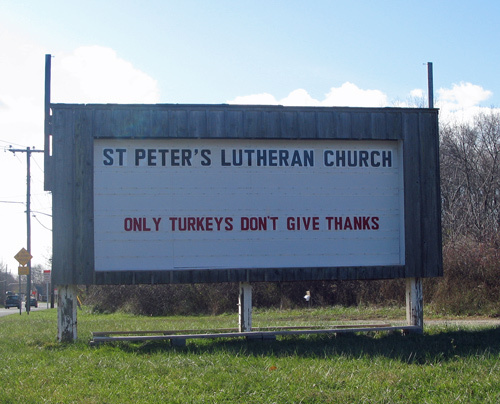 Of all of the local church signs, this particular one consistently has the best quips posted. Even if you aren’t in to the big J.C. you can usually find the humor or value in just the expression itself. I’d have to say that my favorite one was… If God had a refrigerator, your picture would be on it. That would probably be kind of nice. I don’t think anyone else actually has a picture of me anywhere, so if God could hook me up like that I’d really appreciate it. Do you think he knows if the light bulb goes out when he closes the door? Earlier in the evening as I was riding along in the quiet of my helmet, I was struggling in the grips of my usual self-absorbed existential meltdown. The days’ events unfolded like a newspaper, the phone conversations, the private thoughts, the demons that haunt me all there scrolling across my mind as the miles ticked by and the sun set over my shoulder. I realized I’m plagued with wondering if I could ever be brave enough to not withhold the truth about my feelings from people. Would it be more kind to unleash my anger because it would be honest or would it be better to trundle on in my disillusioned disappointment? I don’t know if this road I’m on today will lead me to God or not, but it’s definitely leading me to People-are-Full-of-Shitsville. That’s the next town over from You-are-making-me-crazyburg. The Empire Grill, Skowhegan, Me. Southern Trip Stats – Y’all Come Back Now, Hear? 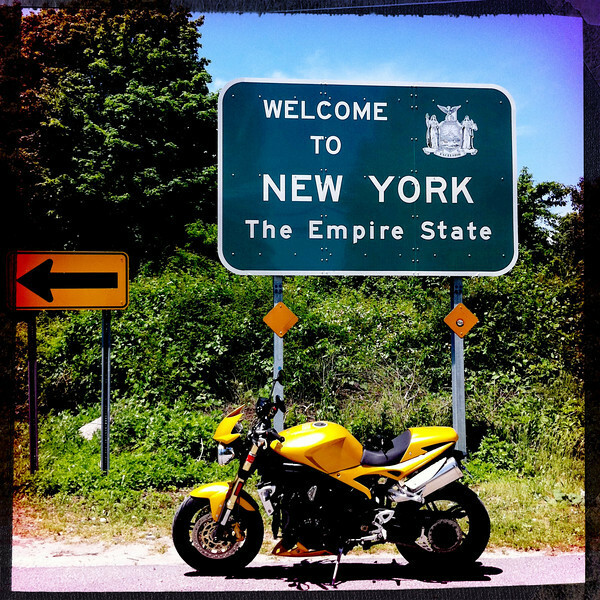 How did you end up at the Girlie Motorcycle Blog? Ask Me Anything: How does being female affect your motorcycling?